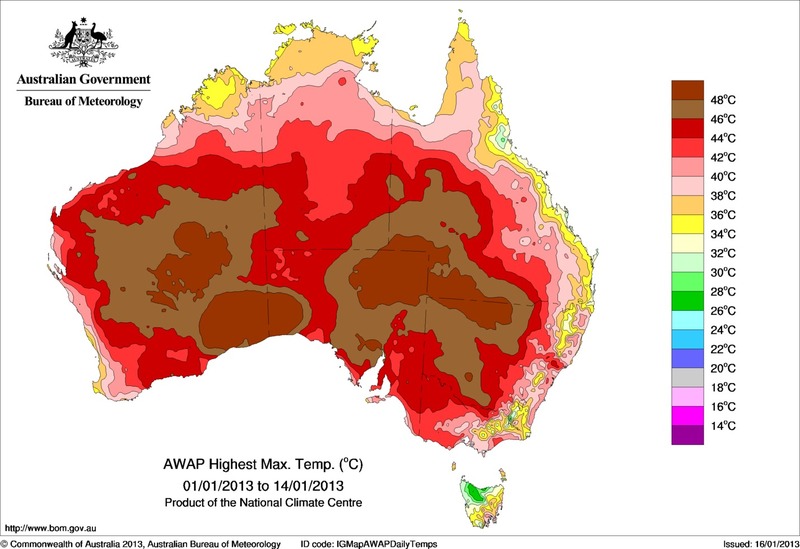 The 114-degree heat in Sydney recently is nothing compared to 121-degrees recorded in Moomba. What this map is showing you is Damn! That's some sweaty weather. The darker red areas in the southwest and north show temperatures as much as 27 degrees above average for this time of year. The much scarcer blue patches, meanwhile, represent places that had abnormally low temperatures. Gray just means that a satellite couldn't collect data, which can happen if it's cloudy. This January, much of the country has been locked into temperatures exceeding 113 degrees thanks to an atmospheric ridge that delayed the rainy season for several weeks. Sydney hit 114 degrees last Friday, establishing a new high for the city in 150 years of record keeping; other historic firsts include 110.7 degrees in Wellington, 111.4 in Adelaide and at the charmingly named gas town of Moomba (you know, right between Innamincka and Strzelecki), a near-impossible-to-believe reading of 121.3 degrees. It is very unusual to have such widespread extreme temperatures – and have them persist for so long. On those two metrics alone, spatial extent and duration, the last two weeks surpasses the only previous analogue in the historical record (since 1910) – a two-week country-wide hot spell during the summer of 1972-1973. Top image courtesy of NASA's Aqua satellite, featured on the Earth Observatory.